The North America market for hydraulic fluid connectors has been witnessing substantial growth over the last few years, thanks to the steady rise in the region’s civil aviation industry. The increasing passenger count for the international and the domestic commute, thanks to the upswing in tourism and business activities, is creating high requirements for new aircraft, which in turn, is influencing the demand for hydraulic fluid connectors in North America. With the U.S. possessing the most powerful air force in the world, the application hydraulic fluid connectors in military aviation is also high in this region. Hitherto, the presence of some of the leading aircraft manufacturers in North America, such as Boeing, Lockheed Martin, and Bell Aircraft Corp., has been creating lucrative opportunities for the vendors hydraulic fluid connectors in this region and is anticipated to remain doing so over the forthcoming years. However, the stringent government regulations and standards set by the aviation industry may limit the usage of these connectors in the North America aerospace industry to some extent in the years to come. The market, which was worth US$535.9 mn in 2015, is expected to expand at a CAGR of 7.10% between 2016 and 2024 and reach a value of US$987.6 mn by the end of 2024. Mobile hydraulics and stationary hydraulics are the two main products available in the North America market for hydraulic fluid connectors. Mobile hydraulics, among the two, have emerged as the most valued product in this market and is expected to continue to be in this position over the next few years, thanks to the rise in the demand for new and bigger aircraft, along with the subsequent increase in the ground support vehicles. The mobile hydraulics segment consists of all the equipment, devices, and crafts that are movable, such as aircraft, container carriers, luggage handling vehicles, and tugs. Airport material handling equipment, such as container loaders, and ground support equipment, such as fueling vehicles, de-icing machines, mobile lifts, loaders, and various other movable machines are also included in mobile hydraulics. On the other hand, the stationary hydraulic product segment includes jet-bridge, hangar equipment, and maintenance equipment only. The U.S. and Canada are the prime domestic markets for hydraulic fluid connectors in North America. With more than 85%, the U.S. led the North America market for hydraulic fluid connectors in 2015. Researchers expect the domestic market to retain its position over the forthcoming years, thanks to the strong economic growth, the presence of a robust aviation industry, and the high disposable income of consumers in this country. The crunching airfare prices are attracting a large number of passengers to travel via air for domestic trips, which is also expected to propel the civil aviation industry, thereby stimulating the U.S. hydraulic fluid connectors market in the near future. The North America market for hydraulic fluid connectors is largely consolidated and is dominated by Parker Hannifin Corp. and Eaton Corp. Plc. Other prominent vendors of hydraulic fluid connectors in North America are Kurt Hydraulics, RYCO Hydraulics Pty. Ltd., Manuli Hydraulics, Gates Corp., ALFAGOMMA S.P.A, B&E Manufacturing Co. Inc., Aerocom Specialty Fittings Inc., Atlas Specialty Products, Faber Enterprises, and Titeflex. Hydraulic fluid connectors are usually metal connectors used to join any hydraulic fluid conductor such as hose, pipe, or tube to other hydraulic devises which may include hydraulic pumps, hydraulic motor, reservoir, cylinders, actuators or other hoses and tubes. These connectors are vital for conveying hydraulic fluids from one device to another. These connectors are extensively used in aerospace realm for crucial hydraulic systems such as flight controls, jet engine pumps, landing gear mechanism etc. These connectors have to meet rigorous quality standards and tests so as to be used in aerospace applications. The report estimates and forecasts the hydraulic fluid connectors market on regional and country levels. The study provides forecast between 2016 and 2024 based on revenue (US$ Mn) with 2015 as the base year. The report comprises an exhaustive value chain analysis for each of the product segments. It provides a comprehensive view of the market. Value chain analysis also offers detailed information about value addition at each stage. It further includes drivers and restraints for the hydraulic fluid connectors market along with their impact on demand during the forecast period. The study also provides key market indicators affecting the growth of the market. It also analyzes opportunities in the hydraulic fluid connectors market on the country level for North America. Drivers, restraints, and opportunities mentioned in the report are justified through quantitative and qualitative data. These have been verified through primary and secondary resources. Furthermore, the report analyzes substitute analysis of Hydraulic fluid connectors. The report applies Porter’s Five Forces Model to determine the degree of competition in the hydraulic fluid connectors market. It comprises qualitative write-up on market attractiveness analysis, wherein end-users and countries have been analyzed based on attractiveness for each country. Growth rate, market size, raw material availability, profit margin, impact strength, technology, competition, and other factors (such as environmental and legal) have been evaluated in order to derive the general attractiveness of the market. It provides comprehensive view of the hydraulic fluid connectors market for North America by dividing it into product and country. 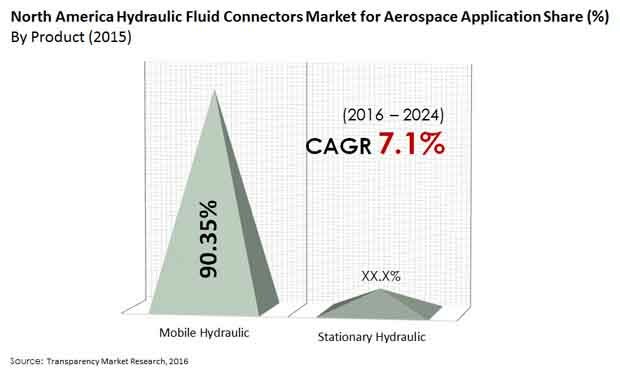 The Hydraulic fluid connectors market for aerospace has been segmented by product into mobile hydraulic and stationary hydraulic. Geographic segmentation includes the current and forecast demand for hydraulic fluid connectors in North America by country namely U.S. and Canada. The segments have been analyzed based on historic, present, and future trends. The report covers detailed competitive outlook that includes market share and profiles of key players operating in the North American market. Major players profiled in the report include Parker Hannifin Corporation, Eaton Corporation Plc, Kurt Hydraulics, Titeflex, and Faber Enterprises. Company profiles include attributes such as company overview, number of employees, brand overview, key competitors, business overview, business strategies, recent/key developments, acquisitions, and financial overview (wherever applicable).